My biggest focus is, I guess, refocusing. We had a long season so it's easy to get lazy, for lack of a better word. Continuing to better myself as an overall football player, like my IQ, technique and things of that nature. [Losing the Super Bowl] makes regrouping a bit tougher. It's like not finishing a mission. We had an incomplete mission. We have another opportunity. I mean, it's a game. We go out there and we're going to fight and strive to win. We're just taking it one day at a time and not necessarily worried about the Super Bowl. First and foremost, Marshal Yanda. 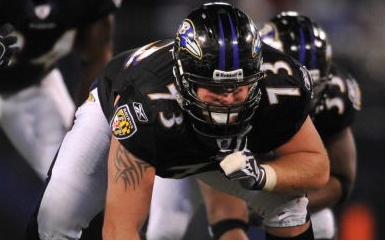 I think if you are a guard and don't [watch film] on Marshal Yanda, you are crazy. He is one of the best in the game. But, I like to look at the guys in my class like Gabe Jackson or Zack Martin, or even a guy like Richie Incognito. Those are great players. It keeps me fresher about what's going on or what's new. Just trying to up my game. I'm trying to find the best word because [Cam Newton] is so many different things. He's incredible as a football player and as a leader for our team. He's somebody who I'd go to war with daily 'cause I know if I fight for him, he's going to fight for me. He's an incredible leader. That's the first thing that jumps out to me and it's on and off the field. Somebody that's there for you, period. I'm going to say we're the best [O-line unit], of course. I mean, if you lack confidence, it's an issue. I think we're the best offensive line and that's something you have to go out and prove weekly. It's not just a one-time job, like, OK, we had a good game, so we're the best offensive line. It's who is the best offensive line this week? So I figure if we win the title of "best offensive line" each week, then we're in a good position. I don't think people understand that I'm in a fight every play. Like I get into a fight every play. Sometimes a little extra or a little less on different plays, but yeah. I don't think people see that. It's hard. My favorite tattoo is probably this one of my grandfather. He passed when I was probably 15. It's my favorite because it means the most to me. I have my arm covered, my left leg to my upper knee, my right leg to my knee, my stomach and my chest. So however many that is. Dontari Poe or Marcell Dareus. I played them in preseason and stuff, so a few snaps here and there, but I've never really had a chance to really play against them. I think they are pretty good, so I want to face them. [Ron Rivera] is a great guy, great coach. He's a great motivator. He's there to give you advice, tell you right and wrong. Listen to you or take advice from you. He's just an overall great person and that's what makes him just an overall great head coach because you feel like he relates to you. He feels me. He understands where I'm coming from. He's been in my position before, you know? The road he's traveled I'm traveling now, so you can kind of look at him in regards to everything and have a better appreciation of his words to you. Right now, it's the first game. I try not to get too ahead of myself or too excited about things to come. Just gotta take it in stride and enjoy this as I'm going through it. Our biggest competition this year?The entire NFC South. After that, the entire NFC. And everybody else. There's no friends in this league, especially once that competition starts. We'll be gunning for everybody like they be gunning for us. For breakfast, I like eggs, toast, bacon. That's usually my go-to breakfast. Lunch is something like salmon and asparagus. But after practice, I'm eating some fried chicken or something. It's me enjoying the process. I don't look at [the play where I took down J.J. Watt] and say, "Oh, I'm so surprised," or "Oh man, I couldn't do that." It's like me walking with boards in my hand. Every step I take, I lay a board down and take another step. That was just another stepping stone for me to keep going. It went from Jacksonville, then the J.J. Watt play. It's just building up. I want to be a perennial Pro Bowler, perennial All-Pro. I want to establish myself as one of the best in the game. I think that's something that's growing for me is I want people to sit back and look at me and say, "Man, he was a great dude or great teammate or great player." The way people think about me and the way I leave my legacy is even becoming bigger to me now that I'm in it. That's something I'm prideful about, how people perceive just Trai. I'm just excited for [training camp and the season]. It's going to be a good one.